BAUER Funderingstechniek were recently contracted to work on an underground parking garage in Leiden, the Netherlands. The project would see the subcontractor contribute towards the deepest underground car park in Europe, with 6 levels placed in a circular shape in the centre of Leiden. When complete, the space will hold enough room for 525 parked cars. 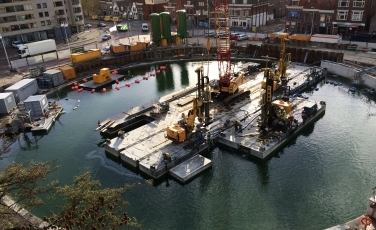 Working under contractor, Combinatie Parkeergarages Leiden and design consultant, Royal Haskoning, BAUER’s brief included the optimisation of pile foundation design through 6 nos, pile load tests on test piles and installation by drilling of the construction piles. BAUER were also requested to remove drilling spoil and recycle water during the pile installation. The project has an overall estimated cost of €29m and work is expected to be complete in early 2017.